Heat oven to 375°F. Line 13x9-inch pan with foil, leaving 2-inch overhang on two sides of pan for easy removal. Spray foil with vegan cooking spray. In large bowl, mix oats, 2 cups flour, the brown sugar, 3/4 teaspoon cinnamon, the baking powder, 1/2 teaspoon salt and the vegan vegetable oil spread stick with pastry blender or fork until crumbly. Transfer 1 1/2 cups of the mixture to another medium bowl; stir in pecans. Press remaining oatmeal mixture into pan. Bake 10 minutes. Meanwhile, in medium bowl, mix Filling ingredients. Spoon over still-warm crust. Sprinkle oatmeal-pecan mixture on top. Bake 38 to 43 minutes or until top is golden brown and apples are tender when pierced with knife. Cool completely in pan on cooling rack, about 2 hours. Carefully remove from pan using foil overhangs; transfer to cutting board. Using serrated knife, cut into 4 rows by 4 rows. Look in the organic/vegan section of your grocery store’s refrigerated dairy case for vegan vegetable oil spread sticks. 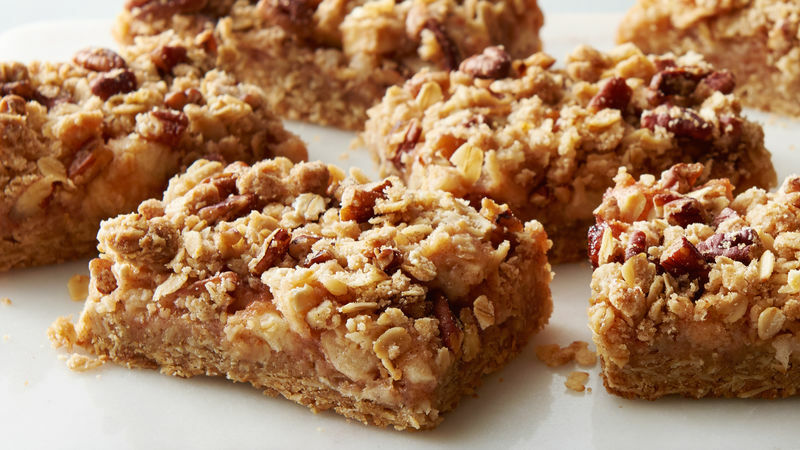 Walnuts can be substituted for the pecans in this recipe. Granny Smith apples have a nice tartness and don’t get too mushy when baked, making them the perfect choice for this recipe.